Recovery path: An Air India plane at the Mumbai international airport. Photo: Adeel Halim/Bloomberg. Mumbai: The management of Air India Ltd (AI) has committed to posting an operating profit in the next fiscal year and a cash profit by 2018—preconditions set by bureaucrats overseeing the airline’s debt recast plan along with SBI Capital Markets Ltd (SBI Caps) for it to qualify for government funding until 2021, two Air India executives said. Though aviation analysts are cynical about these projections, AI executives said these are based on savings on interest cost, phased equity infusion by the government, and adherence to milestones set by government officials led by special secretary (expenditure) Vilasini Ramachandran in the finance ministry. The Reserve Bank of India (RBI) is examining the financial restructuring plan and is expected to give its approval by the end of the month, said one of the AI executives mentioned above, asking not to be identified. Air India has accumulated ₹ 13,300 crore in losses since its merger with Indian Airlines in 2007. The state-run carrier has total loans of ₹ 43,000 crore, including ₹ 22,000 crore of short-term loans. “We have asked for conversion of short-term working capital into long-term capital of ₹ 11,000 crore and ₹ 7,000 crore into cumulative preference shares, paying 8% dividend," the AI executive said. The recast plan proposes that banks should be allowed to carry the debt on their books as performing assets. This is because once an asset is classified as a non-performing asset, banks are required to set aside money for it. Kingfisher Airlines Ltd had a similar debt recast in March. Following this, a consortium of 13 lenders took a 23.21% stake in the airline in April. S. Vishvanathan, managing director and chief executive officer, SBI Caps, the merchant banking arm of the nation’s largest lender State Bank of India, agreed that the debt recast plans of both Kingfisher and AI are similar, even though the airlines have different problems. “The Indian aviation market is intact in long-term perspective. But it has some issues of viability because of high fuel cost and airport charges," Vishvanath said. Kingfisher converted ₹ 750 crore of ₹ 7,000 crore debt into equity at a 61.6% premium over its share price, then at ₹ 64.48 apiece. Its debt as in September rose to ₹ 7,544 crore. The restructuring exercise has not helped the airline tide over the crisis as Kingfisher is asking for ₹ 800 crore as additional working capital and a reduction of interest rates by converting a part of rupee loans into dollar loans. The government’s equity infusion instalments are too small for AI to survive, said aviation expert and aerospace journalist Hormuz P. Mama. “I am not hopeful as Air India cannot do much without reducing staff strength of 30,000. The Indian government cannot keep on pumping money to keep it afloat," Mama said. Mounting losses and a high jet fuel cost have forced AI to delay salary payments. Employees got productivity-linked incentives of July and the salary of October last week. “Air India is expected to get a savings of ₹ 1,000 crore through this debt recast," said a second Air India executive, who also declined to be identified. He said the carrier has asked for additional concessions, without divulging details. “Strict milestones have been prescribed by the committee of officers to qualify for the equity infusion and financial support," the first executive said. “Air India needs to attain an average seat occupancy of 73% by 2015 across its network and 75% by 2020. We have also come up with various cost-cutting measures to qualify for the staggered equity infusion." 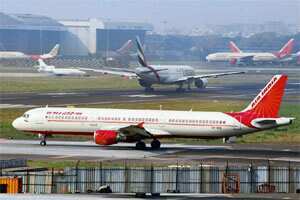 Air India is planning to increase the utilization of Boeing 777 planes from 263 hours a month to 277 hours during winter, he said. Similarly, it plans to increase the utilization of Airbus A320 planes to 673 hours a month from 607 hours. “We are phasing out old planes and making promotional offers to boost first- and business-class ticket sales. We are planning to increase fares to offset the fuel prices increase. Also, we are introducing VRS (voluntary retirement scheme) to reduce excess manpower," the first executive said. AI is seeking a total equity support of ₹ 42,920 crore until fiscal 2021. It also wants government guarantees for aircraft loans worth ₹ 30,584 crore until 2021. According to the new equity infusion plan, AI will get ₹ 6,750 crore worth of equity from the government after RBI gives its nod to the debt recast plan. At the same time, the airline will start monetizing its surplus real estate assets and transfer some of its employees to subsidiaries.